Today is one of my best friend’s birthdays. Her name is Robin Grant. She is one of the most talented, most hilarious people I have ever known, and I am grateful to call her a friend. She always keeps me on my toes with her texts, pictures, new ideas and creativity. She decided that to ring in her birthday this year, we would celebrate by going rollerskating!! Ummm…HELLO???!! AWESOME. Her husband rented one of the party rooms complete with a sheet cake with roller-skates on it, pizza, Diet Coke and Sprite! We suddenly all became 12 years old again and were swept back to our childhoods…to high socks and skate rentals, trying to remember how to stop and not fall, dodging the innocent young children skating carefree to Taylor Swift. Here is a picture of Corky (left), Robin (in the middle) and me holding hands – just like the good ol’ days when you grabbed your best friend’s hand and held on for dear life. This was a blast, and such a breath of fresh air!! Robin is gluten free, so I made her some gluten free cupcakes and decided to dress them up a bit for her birthday surprise. I originally was planning on making a cupcake bouquet for her in a potting plant, but because the gluten free cupcakes are so fragile, they kept falling apart! At 11am today I started freaking out because I had a bunch of flower cupcakes and they weren’t holding in the bouquet! I immediately got in the car and headed to Michael’s. I thought – well, maybe I can make it look like they were just “planted,” so I went for a “garden” rather than a potted plant. And that’s exactly what I did!! 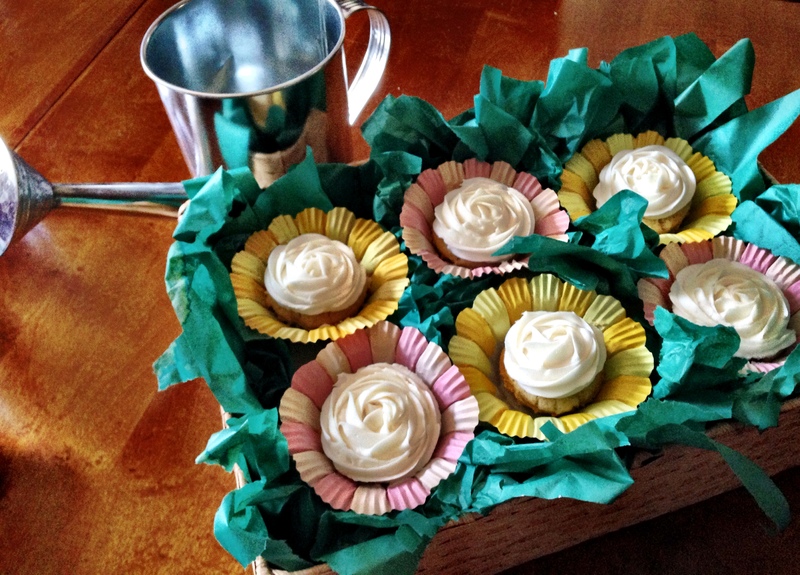 For the cupcakes, I found the GF Vanilla Cupcakes on Gluten Free Gigi and the buttercream icing on Add A Pinch. Make sure to check out Robin’s awesome blog – Sing Fly Love. She’s a brilliant writer, and you will love following her adventures and creations! In a mixing bowl, combine butter substitute and sugar and beat until smooth sugar begins to dissolve a bit. Add eggs and vanilla; stir until mixture is uniform. Add half of flour mixture to sugar mixture; stir. Pour in milk; stir, then add remaining flour and stir until batter is smooth. Spoon batter into prepared pan, dividing evenly between sections of pan. Bake 12-15 minutes, just until cupcakes rise and turn light golden brown on top. Remove from oven to cool, then frost as desired.